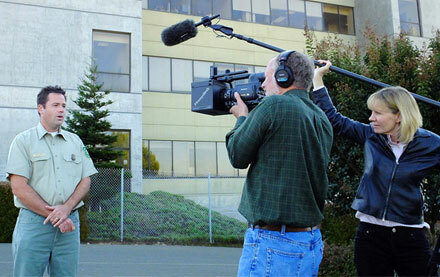 PRomptBox is perfect for any kind of video shoot in the field. It is lightweight, compact, and requires no power source other than a working smart phone or tablet. PRomptBox was recently featured in an article in government video magazine, and you see it in use by a forest service team in the photo here. Prompting on location has always been a struggle since traditional prompters require a heavy-duty tripod, laptop, cables and power, but with PRomptBox, all of that has changed. PRomptBox Mobile uses a tablet or cell phone as the screen, so mounting to a dSLR or camcorder is easy. 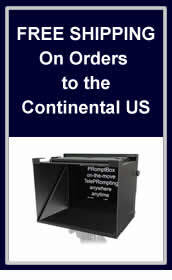 PRomptBox uses a proprietary top shoe mount or 1/4- 20 pistol-grip mount from below. The system is adjustable to full-size cameras, including studio cameras, jibs or Steadicams, and can be deployed easily in the studio or in the field. 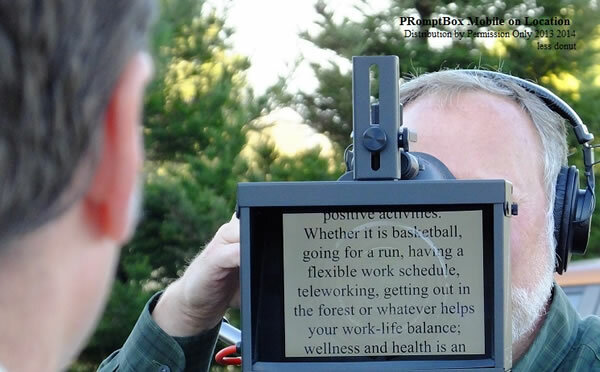 Here’s a sample scenario used by the Dunskys for the Forest Service: They dictate text into a mobile device, tap “Save,” tap “Loop” and the mirrored script appears on the screen. They place the same mobile device into the PRomptBox, and it’s ready for production.